The Skinny: A genuinely funny and offbeat cop comedy. Michael Chow and Michael Wong are good sports, managing to make fun of themselves as well as each other. by Kozo: This off-beat cop mystery movie from producer Danny Lee is an unexpected pleasure. Michael Chow is the chief cop of Tai O, a small town on Lantau Island that moves at an absurdly slow pace. 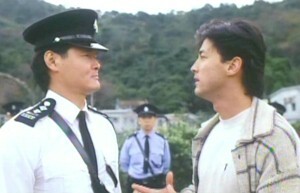 When a local man turns up dead, head cop Danny Lee (in a requisite cameo) sends in chief inspector Michael Wong to crack the case. What Michael gets is culture shock as the dysfunctional locals baffle him with their hilariously skewed ways. First they throw him in jail, and things only get worse after that. What Wong discovers is that nearly everyone wanted the murder victim dead, and cracking the case is going to take more than his SDU-hardened police methods. What he needs is a good dose of laid-back Tai O investigation courtesy of Michael Chow, who’s terrific as the overweight, lackadaisical chief.